Author Stan-Collins Ubaka is a priest who has had to settle many cases where children were born out of wedlock and then the fathers denied responsibility for their actions. 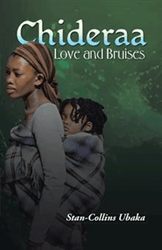 Ubaka addresses with issue with the main theme of betrayal in his new novel, “Chideraa: Love and Bruises” (published by iUniverse), which follows the fictional journey of one young woman caught up in just such an experience. Ada is but an innocent youngster in love when the man of her dreams drugs her and rapes her after his attempts to convince her to have a premarital affair go unheeded. Though many advise her to abort the baby she conceives, Ada carries her pregnancy to term. When her precious baby boy, Chideraa, is stolen from her house, Ada encounters an emotional rollercoaster that seems never ending. Throughout the story, Ada turns to her priest for advice and comfort. Ubaka hopes to help readers understand that though there is a high rate of children born out of wedlock, there is hope in life. iUniverse is an Author Solutions, LLC, supported self-publishing services provider that partners with Berrett-Koehler to offer Open Book Editions and True Directions – in partnership with Tarcher – a division of Penguin Books. Additionally, iUniverse maintains a strategic alliance with leading Canadian Book retailer Indigo Chapters. To recognize excellence in publishing, iUniverse offers select authors the Star Award, Reader’s Choice, and Editor’s Choice designations based on specific criteria. To learn more about iUniverse’s publishing services, please visit iuniverse.com or call 1-800-AUTHORS. For the latest, follow @iuniverse on Twitter and “Like” us on Facebook at facebook.com/iuniverseselfpublishing.